LULC (Land Use Land Cover) data for locations in the United States has been provided by the USGS (U.S. Geological Survey) over the years using several different formats. Legacy LULC data sets are often found that use two different formats for LULC data for the same region: the GIRAS (Geographical Information Retrieval and Analysis System) vector format, and CTG (Composite Theme Grid) raster format. CTG format is also known as Grid Cell format since it is often published in a file called grid_cell. LULC data in these formats can usually be found for each of the 1:100K and 1:250K regions traditionally served by USGS. 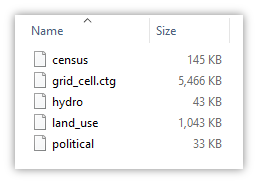 It is not always easy to remember that the grid_cell file uses a different format, so Manifold users will rename the grid_cell file to grid_cell.ctg to indicate it is a raster file in CTG format, a different format used than the other four files. The grid_cell.ctg file can be imported into Manifold using the CTG dataport. 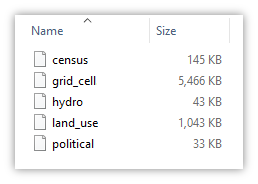 The other four files can be imported into Manifold using the GIRAS vector format dataport. 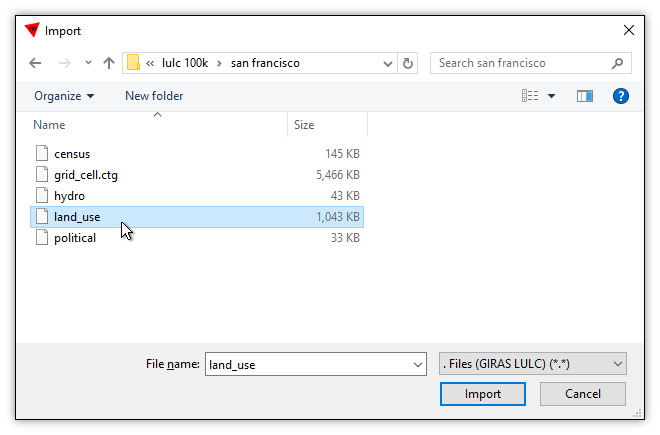 For example, to import the land_use drawing we can either just double-click it and Manifold will discover it is a GIRAS format file and import it, or we could manually specify use of the .Files (GIRAS) (*. *) dataport. In the Import dialog browse to the location of the file. A table and a drawing will be created. 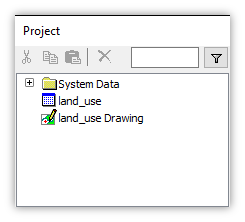 In the example above we have double-clicked on the land_use file to import that file and to create a land_use table and a land_use Drawing drawing in the project pane. For a step-by-step example of importing and then Styling a CTG file, see the Example: Import CTG Grid Cell File and Style topic. Oceans may be coded with a value of 2000000102 or 0.